The self-proclaimed “best beer bar for the unpretentious craft beer drinker,” is a dark, energetic and sometimes rather loud bar that has had a good beer line-up for years. They feature more than 20 taps and another 20+ bottles offering a selection of domestic craft beers, Belgians and other interesting imports. 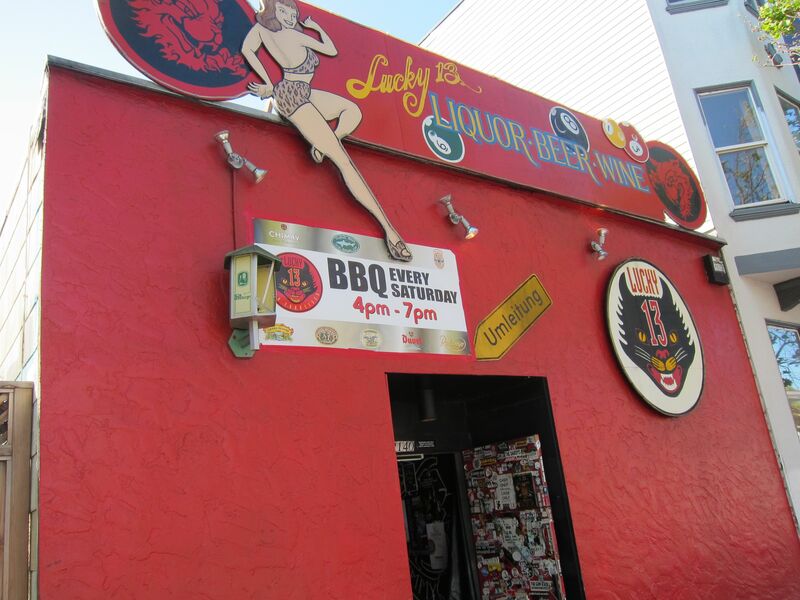 Extras:Lucky 13 has a small back patio with free BBQ on Saturdays during the warmer months. It can be amusingly dog-friendly, with a fair bit of “dive” ambiance. Also, they are within easy walking distance of Toronado on Haight Street. You could walk from Civic Center BART or 16th Street BART, though it’s over a mile. You may want to take SF MUNI to get to within a block. From the east: at your choice of the Embarcadero, Montgomery, Powell or Civic Center stations, exit BART and enter MUNI Metro underground in the same station. (You will have to pay again.) Take MUNI outbound trains K, L, M or T to Church Street Station. Exit MUNI on the North (outbound) side of the platform where you got off. Walk 1/2 block uphill along Market to Lucky 13. From the south, if you prefer, get off at 16th St BART, exit on the east side of Mission Street. Take the 22 Fillmore bus from the northeast corner of 16th and Mission. Get off at Market Street. Cross both Market and Church Streets and walk 1/2 block west.